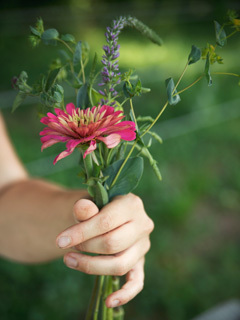 Take a stem of foliage (like buplerum), a stem of filler flower (like yarrow), and a big beautiful feature bloom (like zinnia), and form a cluster between the index finger and thumb of your non-dominant hand (i.e., right handers hold the flowers in their left hand). Hold the cluster approximately four to six inches below the flowers. Add one flower at a time around the center cluster. Put each stem in your dominant hand at varying angles to create a full look. Turn the bouquet a quarter turn at a time to add more stems. 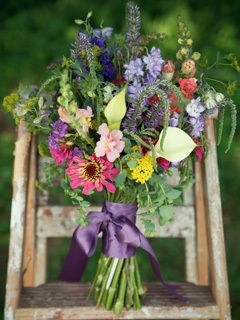 Alternate between foliage, filler flowers and big feature blooms to give the bouquet balance and interest. When you’re pleased with the bouquet, use scissors to trim the stems so they are all even, usually about seven to nine inches in length. Use a rubber band to secure the stems at the spot you were holding them while designing the bouquet. Take a long length of florist tape and wrap it tightly around the stems, starting at the top just under the flowers and working down as far as you want ribbon to go. Now wrap ribbon over the florist tape, taking care to overlap it evenly. Use pins or glue to secure the ribbon. 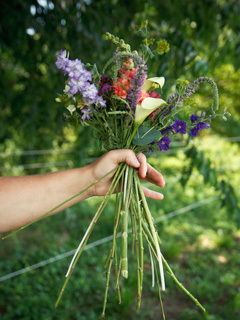 Keep the bouquet in water in a cool dark spot until just before you are ready to take pictures or walk down the aisle. Put the bouquet back in water after the ceremony to perk it up and keep it beautiful throughout the reception.